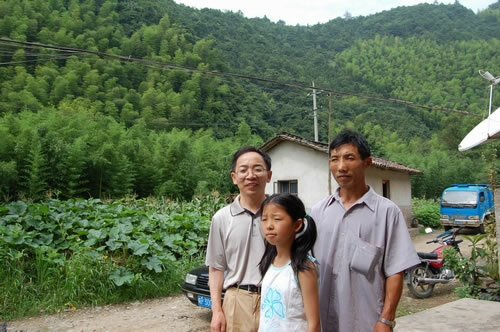 Qing Zhu is a 7 years old girl in 1st grade during 05-06.She is living with her grandparents. Her father died of cancer this year and her mother left. 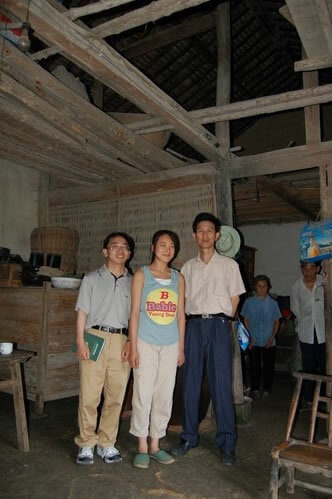 She likes mathematics。She has been sponsored by Wei Zhou since 2005. Guo-Wei Ye is living with his aging grandpareents. His parents died of poison four years ago (possible homicide). and became weaker ever since. Partially due to my health issue, this interview was done at a restaurant in the closest town. They walked 2 miles (no car can go in) and then took a bus to the town to meet with us. He has been sponsored by Jianjun Wang and Tin Tang since 2004. Lin Ge is in 3th grade during 05-06 and was born in 1995. She lives with her grandma, parents, and her sister. Her mother is retarded,and her father is alightly retarded and does not speak very clearly. Her sister is in a vational high school. She likes Chinese and is good at both Chinese and Mathematics.She has been sponsored by Eric Fang and Yao Zheng since 2005. The right one is her father. Fang Wang is in 9th grade during 05-06 and is expected to go to high school next Fall. She is in top 5 in her class. She lives with her parents and grandparents. Her father became really weak five years old without cause. It took him three years and a lot of medical expenses to find the cause. He is better now and can work a little again. Her grandma is often sick and her grandpa is 71 and helping the family a little. Her favorite subject in school is politics. She hopes to earn enough money to take care of her parents when she grows up. Her dream is becoming a lawyer. Li-Min Yan was born in 1990 and is in 11th grade during 05-06. Her father died in 2003 of disease, and her mother of 50 looks much older and has often headache with no job. She is in top 3 in her class of 52 and 80th in her grade of over 900 students. She likes Chinese and English. Her writint earned her a couple of awards. She has been sponsored by Jian-Shu Li and Ren-Lan Liao since 2004.